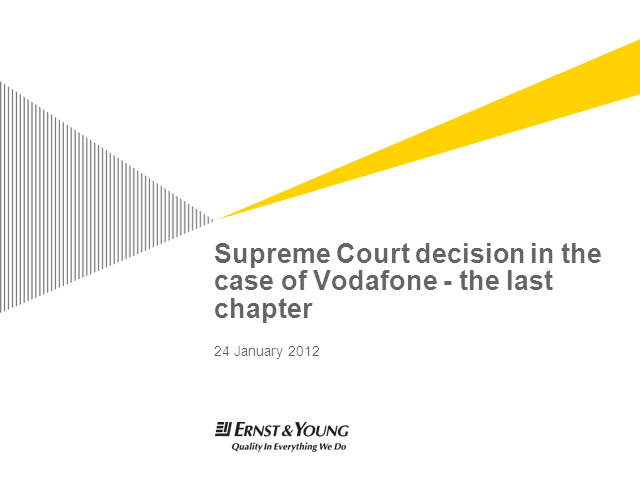 The Supreme Court, the apex court of India, has given its judgment in the Vodafone case covering the taxability of offshore transactions when shares of an overseas company directly or indirectly holding shares of/interests in an Indian company are transferred. This web seminar will analyse the key points that taxpayers should take from the decision, discuss the effect of the ruling on similar situations in dispute at the moment and highlight the options for companies faced with decisions about these sorts of transactions in the future. The web seminar will be followed by a Q&A where you will have the opportunity to ask questions of leading Indian tax specialists who deal with these issues every day.